NASA is working on a microgravity-optimised 3D printer to send up the International Space Station. The 3D printer is expected to launch later this month. NASA astronaut Timothy J Creamer, who spent more than six months aboard the International Space Station (ISS) in 2010, explained the benefits of 3D printing in space. “I remember when the tip broke off a tool during a mission,” he said. “I had to wait for the next shuttle to come up to bring me a new one. 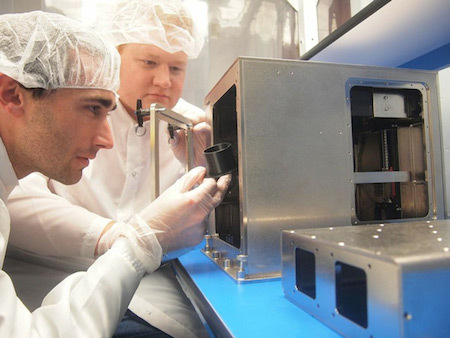 Developed under a NASA contract by commercial company Made In Space, the printer will be tested aboard the ISS and, if successful, will be used as the basis for a commercial-scale 3D printer known as the Additive Manufacturing Facility, or AMF. This will serve as a kind of extraterrestrial maker space by not only enabling the quick printing of replacement parts, but also as a research tool that can be used by Earth-based academics to 3D print in space. I guess it's too early to think that we now have orbiting factories, like the ones in Arthur C. Clarke's still excellent 1978 novel The Fountains of Paradise, but we're definitely getting there.